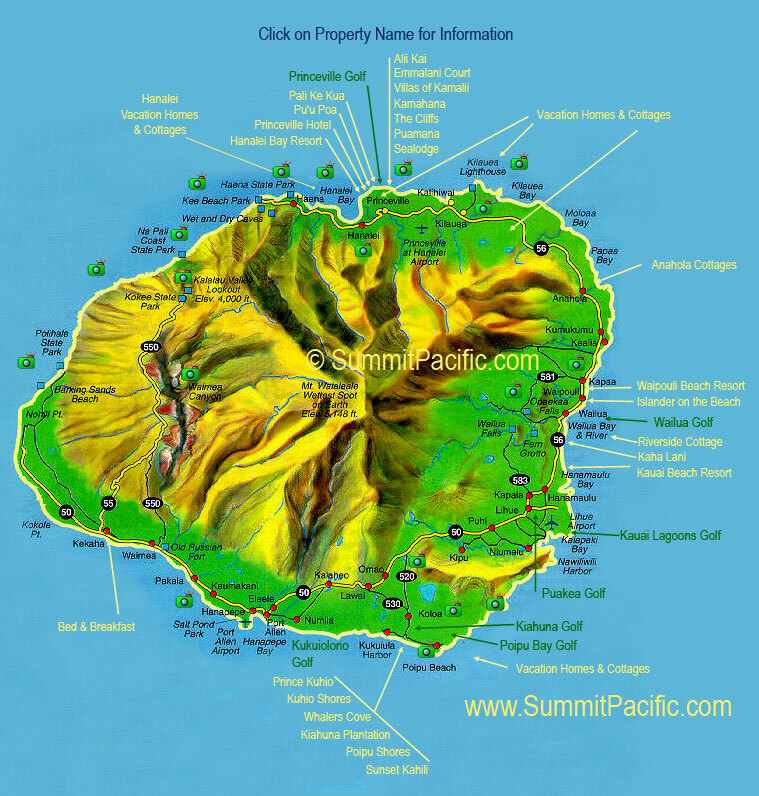 Kauai's map shows an island 33 miles long and roughly 25 miles wide, encompassing 554 square miles in diameter. Kauai's 90 miles of shoreline has more beaches per mile than any others in the Hawaiian chain. Kauai's interior is very mountainous with steep canyons and towering peaks. Mount Kawaikini (5,243 feet) and Mount Waialeale (5148 feet) are Kauai's highest points. Mount Waialeale is known as the "wettest spot on Earth" receiving an average of 480 inches (40 feet) of rain per year. Hundreds of waterfalls cascade down streams and rivers as this rainfall makes its way to the ocean. The Waimea is Hawaii's longest river at 20 miles and moves 150 million gallons of water per day into the sea. Kauai's Wailua River is the state's only navigable waterway. The interior of Kauai is mostly uninhabited with its population of 51,000 living mostly along the shores in small towns like Lihue, Kapa'a, Koloa, Hanapepe, Princeville, and Hanalei. Kauai is known as the "Garden Isle" for its abundance of tropical flowers and blossoms. It is also famous for white sand beaches, towering peaks, waterfalls, and tropical rainforests making it truly one of the world's most beautiful islands. Kauai is a favorite for tourists, honeymooners, and film makers. Jurassic Park, South Pacific, Raiders of the Lost Ark, King Kong, and even Fantasy Island were all filmed on Kauai.